The German legislator gives shipping companies or operators under certain conditions the permission to change to a foreign flag for a limited amount of time. In accordance with § 7 of the “Flaggenrechtsgesetz” (flag act), the ship remains registered in a German shipping register throughout the change to a foreign flag but receives the permission to fly a foreign flag. A flagged-out ship is subject to the law of the foreign flag. The only exception is, under certain conditions, social security for German crew members on foreign flagged ships. More information about this under "Social Security". The responsible Federal Maritime and Hydrographic Agency (Bundesamt für Seeschifffahrt und Hydrographie – BSH) can permit the change to a foreign flag for two years. Shipping companies and operators can repeatedly apply for a permit for limited operation under a foreign flag. by making a compensation payment (secondary obligation). Depending on the chosen option a different application form for a change to a foreign flag is to be submitted to the BSH. The shipowner or operator can compensate for the disadvantage of the German shipping sector by training either a ship mechanic or a navigational or engineering assistant officer on the flagged-out ship. 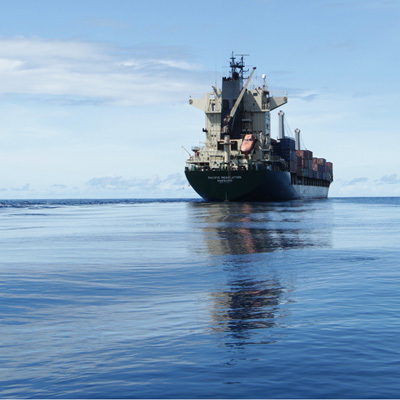 Depending on the size of ship, the required duration of the training obligation on board the flagged-out ship so that no compensation payment becomes due varies. It can be between one and 5.5 months for every year of the permission for limited operation under foreign flag; further information is given in "Hinweise zur Ausbildungsverpflichtung" (notes regarding the training obligation, in German only) and in the annex second sentence of § 7(2) of the "Flaggenrechtsgesetz" (German flag act). The respective period of time that a training position must be offered begins with the permit for limited operation under foreign flag entering into force. The BSH will verify, whether the training obligation has actually been fulfilled. If training is not or no longer performed the compensation payment is due from the date the permit for limited operation under foreign flag had become effective. If a shipowner or operator cannot or does not want to train, alternatively, he can make a compensation payment to the “Stiftung Schifffahrtsstandort Deutschland” (German shipping foundation). The amount of the annual compensation payment depends on the size of the ship and is published in the Federal Gazette (Bundesanzeiger). Legal basis for the obligation to make compensation payments is the fourth sentence of § 7(5) of the Flaggenrechtsgesetz (German flag act).